The leader/ender from 2015 is now a quilt top. It measures 54″ x 61″ which is my preferred size for a charity quilt. 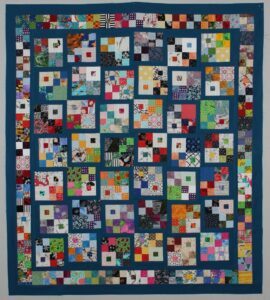 I think the bulls-eye blocks add a bit of interest and movement to the quilt. I hope to machine quilt this top sooner rather than later, but first I need to finish the wool flowers & embroidery on the Friends are Flowers wallhanging and piece a small sampler quilt for the hand quilting lesson later this month. I also need to decide on a new leader/ender project – decisions, decisions. Hope everyone is staying warm and finding some time to quilt.